Earth's Interior WebQuest!! - Can you really dig to China? 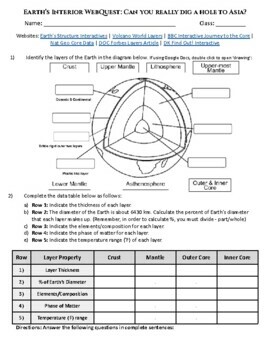 I used this activity with my middle school students as a culminating project/WebQuest after studying Earth's Layers & Interior. 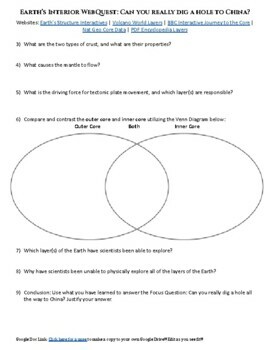 Activities include: labeling the layers, finding information from a .org and a .edu science site, completing a Venn diagram, and answering questions from the sites, non-fiction resource reference. Labeling includes: Crust, mantle, outer core, inner core, asthenosphere, lithosphere. Also included is a word document where you can edit to align with your curriculum as needed.